The Rooftop ... designed to transition from a relaxed vibe by day to an exciting atmosphere by night. 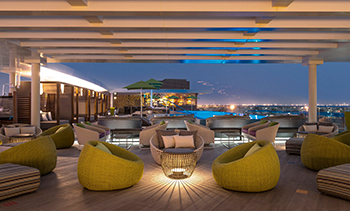 For the Aloft Al Ain Hotel, KKD came up with exclusive design concepts, including the all-day dining concept Olive Tree; new VIP suites, and The Rooftop – the only rooftop pool bar in Al Ain. The recently opened four-star hotel now stands testimony to the design consultancy’s prowess in modifying the US concept to local tones and developing new experiences to meet the UAE’s four-star standard. New concepts created by KKD specifically for Aloft Al Ain include the all-day-dining concept Olive Tree; new VIP suites, and The Rooftop – the only rooftop pool bar in Al Ain. Aloft Al Ain is Marriott International’s first property in the garden city and Aloft’s second property in the UAE, following Aloft Abu Dhabi. The striking new Aloft hotel is one of the cornerstones of Al Ain’s 500,000-sq-m mixed-use Hazza Bin Zayed Stadium development, owned by developer Al Qattara Investments. The new Aloft hotel offers a new starting point for travellers looking to discover Al Ain, with a bold attitude and aesthetic that makes it unlike anywhere else in the city. It is KKD’s second project within the development – the consultancy having previously worked with the developer on the design of the stadium’s public spaces and VIP suites. The all-day-dining concept Olive Tree ... airy and contemporary. The scope of works carried out at Aloft Al Ain by KKD included interior architectural design and development, spatial planning and overseeing design implementation. BAM International was the fit-out contractor on the project. As lead interior designers on the project, KDD also detailed the design of the rest of the hotel in line with Aloft’s global brand standards. This included the re:mix living room, re:fuel 24/7 snack bar, re:charge fitness centre, W XYZ cocktail bar, Tactic meeting rooms and the 175 standard and double guestrooms. KKD’s approach embodies Aloft’s ‘Different By Design’ ethos, bringing the energetic brand experience to life throughout the hotel. The expressive, open spaces foster chance encounters between travellers. The Aloft brand’s design approach is a vibrant mix of urban-influenced modernist style with a bold yet sophisticated use of colour. The standout design elements of the hotel’s public areas are the industrial exposed ceilings, concrete floors, and large, colourful modern artworks. The overall materials palette throughout is natural with an urban edge – featuring polished and matte concrete, untreated and varnished wood, and rough and smooth travertine. Furnishings are casually stylish; a modern take on the 1970s design classics. The 17,000-sq-m Aloft Al Ain features four floors of loft-like rooms, including four food and beverage options and 175 bedrooms. The flexible, social spaces are designed to transform as travellers arrive throughout the day and night. Guests enter the hotel below an eye-catching canopy decorated in a spectrum of blues and yellows, with dynamic horizontal lines that pull the eye in towards the lobby. Inside the loft-like reception lobby, the circular front desk is recognisably Aloft – a proprietary design component that varies by location. In the Al Ain hotel, the desk is wrapped in semi-abstract illustrations in shades of warm red, orange and pink, and backlit to glow invitingly. Topped in dark grey concrete, the desk reinforces the industrial aesthetic and creates a strong focal point, highlighted by two starburst chandeliers above. Small clusters of informal seating mark the perimeter walls, with a digital ticker running across the left-hand wall to give guests live news updates. To the far right of the reception area, the re:fuel 24-hour self-serve snack bar offers guests refreshments, on arrival and on-the-go. Opposite, the chic and social re:mix living room is furnished with comfortable sofas and a pool table, and lit by clusters of paper lanterns in different shapes and sizes. W XYZ, also on the ground floor, is a lively bar and lounge whose key design features include the illuminated iceberg bar top and full floor-to-ceiling windows, which are criss-crossed by colourful ropes in red, orange, yellow and green. Translucent white floor-to-ceiling curtains allow the lounge to be divided into smaller, private areas. The meeting spaces on the ground floor – playfully known as Tactic Rooms – continue Aloft’s contemporary look and feel. KKD’s concept for Olive Tree features a softer, complementary take on Aloft’s style. Occupying the ground floor next to the re:mix living room, the restaurant features an airy, contemporary setting. Floor-to-ceiling windows blur indoors with outdoors, opening up views of the square outside and generously bathing the restaurant in natural light. The subtle pastel tones of the interior reflect the restaurant’s fresh menu, while dashes of olive green – chosen for divider curtains and place settings – subtly echo its name. The powder blue of the leather banquette seating is enhanced by the natural orange of the brickwork behind, and copper details create a chic yet relaxed vibe. Warm untreated timber is used for the serving units, dining chairs, bespoke tables and wall cladding, while the open kitchen is framed by white ceramic tiles, light grey counters tops, and black metal with ribbed glass. Lighting is a key element of the space. The central dining area is illuminated by bespoke over-sized, copper-spun pendant lights powder-coated in white, which create a warm, inviting glow and emphasise the height of the ceilings. This warmth is enhanced by smaller, polished copper pendant lights lining the windows and wall-mounted floating arm lights lining the brick walls. The standard bedrooms feature Aloft’s signature style. The deep, bold colour palette comprises dark blues against a backdrop of warm greys, with soft furnishings adding accents of mustard, light yellow and orange. Pixelated images and patterns decorate the window blinds and bed cushions, creating a fun, ‘digital’ aesthetic. KKD evolved and upgraded Aloft’s standard bedroom concept to create two new VIP suites. These rooms include a spacious kitchen and open-plan living and dining area. The design features a lighter, fresher look and feel, with untreated wooden flooring and bright splashes of colour added through surface materials and the soft furnishings. Located on the fourth and final floor, The Rooftop is a destination open-air lounge bar with an outdoor terrace and infinity-edge pool. The new concept is designed by KKD to transition from a blissful, relaxed vibe by day to an enthralling and exciting atmosphere by night. The interior of The Rooftop features dynamic zigzag shelving behind the bar, interspersed with mirrors and high-gloss squares in dark violet. The shelving adds visual drama to the space, and echoes the geometric façade of the Hazza Bin Zayed Stadium next door. The front of the bar is clad in translucent onyx panels – a stunning natural element that contrasts with the man-made character of the other predominantly urban materials. Dramatically backlit, it creates a halo of light around the bar and an elegant ambiance. The rest of the interior features a muted, restricted variation of Aloft’s colour palette, with grey and purple soft furnishings. The bar’s grey wood-effect tile flooring continues seamlessly outside to the terrace, surrounding the Splash Pool. Brown-grey cabanas and sun loungers, yellow-green wicker chairs, scatter cushions and parasols make it the perfect place to relax in the sun. Staying true to Aloft’s eclectic style, small pops of bright primary colours appear throughout: a red chair here and there, and colourful clusters of porcelain tiles interspersed between the grey flooring. The pool’s outdoor bar is backed with multi-coloured, mosaic-like tiles that create a pixelated effect, reiterating the same fun ‘digital’ aesthetic of the bedrooms.